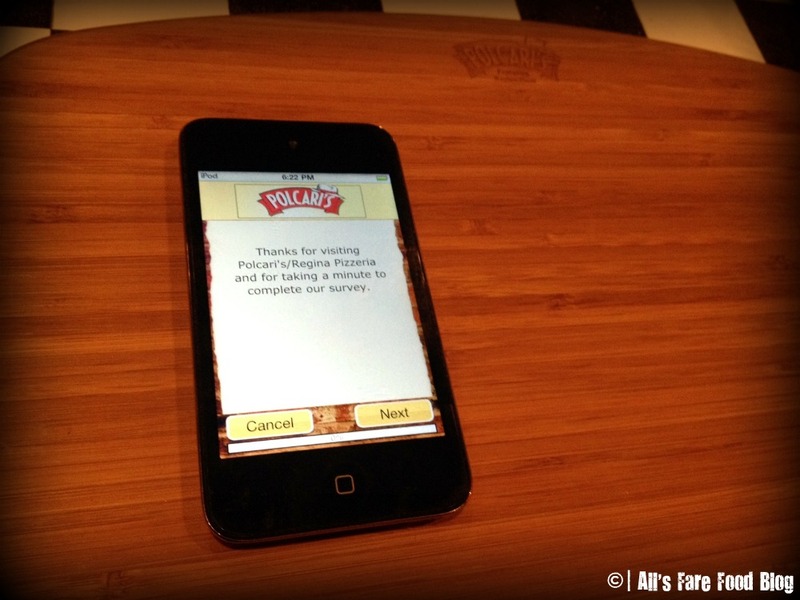 An iPhone (attached to a wooden board) with a preloaded program for guests to input their thoughts about the meal they just had. It’s a simple step-by-step process asking you about your meal, server, cleanliness and how likely you are to recommend the restaurant to friends. The program uses a slider scale from thumbs up to thumbs down for your rating. Overall, I think it’s a great idea for businesses to make that leap into the 21st Century, using technology to learn more about the people who are sitting at their tables and booths, and creating better experiences based on customer-provided information. This entry was posted in Cuisine - Italian, Food - General, Foodie Firsts, Places - Massachusetts and tagged App, iPhone, Italian, Pizzeria Regina, Polcari's, reviews, Saugus by Christina. Bookmark the permalink.